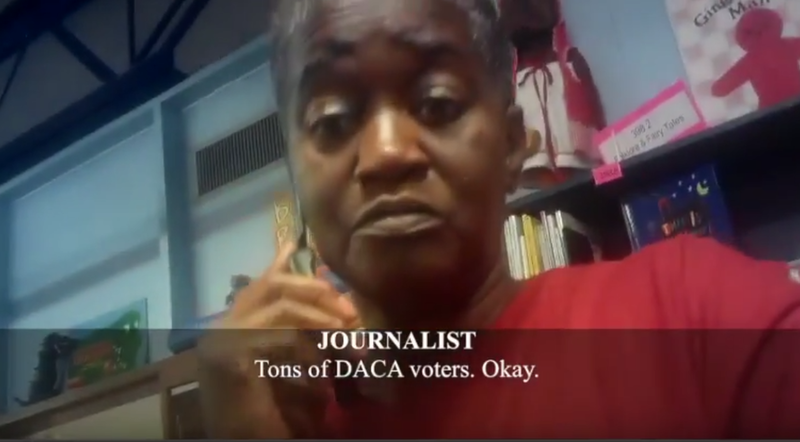 A new video from James O'Keefe's Project Veritas shows a Texas poll worker admitting that "tons" of non-citizens have been voting. The video features an undercover Veritas operative asking whether or not her non-citizen boyfriend can vote in Tuesday's midterm election. One poll worker, Deborah Brooks-Wims tells the operative "If he has his ID that's all he needs. If he's registered." "It doesn't matter that he's not a citizen?" asks the Veritas journalist. "No! No, if he's registered, he has a... honey, it might not be that he's registered. If he's giving you all this trouble it may not be that he's registered." The journalist then says: "He's saying he saw some mess on the internet saying that it's not legal for him to vote since he's not a [unintelligible]," to which the poll worker responds "Don't pay attention to that. Bring him up here." Another poll worker, Pam Nash, was told that the undercover journalist's boyfriend was "really nervous" and "out in the car" waiting to vote. Nash says "No, you tell him no, we got a lot of 'em," adding "Go get him, bring him in."